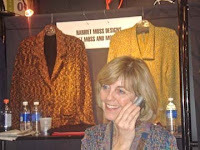 Baltimore's Annual Craft Show - Unstoppable Art! Friday was the day planned for our yearly craft show jaunt but Mom Nature had other ideas. Freezing rain, sleet, ice were forecast and the day started out like the forecasters predicted so we stayed home. We could have gone. As often happens, the weather for the most part was a “non-event” in the Baltimore area. The media had reporters all over town and TV talking about how bad it would be, and they succeeded in spreading fear and doubt. Kind of reminds me of real estate and the media’s “doom and gloom” Gloom and Doom? Don't Believe It! The hardworking artists lost many potential buyers because the media reported such bad weather that did not materialize. We hope they made up for Friday's smaller crowds on Saturday and Sunday – I can say for sure that by Saturday afternoon the aisles of the massive Baltimore Convention Center were packed. So where was my head? Shoulda, coulda, but didn’t take along some laminated copies of last year’s blog They Gotta Live Somewhere to this year's ACC Craft Show. Most of last year’s artists were back again this year, and it would have been nice to pass them out to the artists that I featured in 2007. Just take a look at goodies in this year's spectacular show. Maybe next year I will remember to bring copies along and give them to the artists who were kind enough to allow us to take the photos. Like last year, going with a best friend makes it ever so special. Both of us are artists and both of us see beauty in things others may miss. We have a habit of saying “Oh look at that,” “You would like that,” and “Those are your colors!” Friends do that; they look out for the other more than for themselves. We both said we were not going to buy anything this year. Yeah right!! It didn't take me long to need one of the show tote bags. Just a few booths down the first row I found Susan Sanders of Alexandria, VA, and her "Silkworms." These very unusual necklaces are crafted of multiple silk strands and have a hand-made magnetic closure. Put it on and click, you're ready to go. Of course I had to have the one-of-a-kind in tones of brown with gold/bronze threads. While she was choosing earrings, I was next door with Harriet Moss' Handcrafted Wearables from McLean, VA and her yummy hand woven and knit sweaters and jackets. Of course there was one in brown with my name on it! http://harrietmoss.com/home.php Harriet was a delight to talk with, and even helped us decide which pair of earrings looked best on my friend. Artists are special people. A special bond forms when you own a handmade piece by a fellow artisan. Other artists caught our attention for their creative use of materials. We’ve all seen bowls and mugs, but one artist had turned stoneware into birds – there were puffin mugs, a loon teapot, and what can you say about a double swan serving piece but "Oh, look at this!" Judy Stone from California had a booth filled with wonderful enamels but instead of the typical jewelry for the body, hers was jewelry for the home. 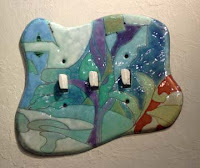 I thought her enameled switch plates and outlet covers would make a great new-home gifts for a special client. www.jstoneenamels.com. It was just what we both needed – a day away from the usual work and a recharge for the creative core. What's an ACRE Besides Land? I am! With years of experience as a successful real estate agent, I'm still always looking for ways to do more for my clients. There are lots of courses I can take, and I do, to keep up to date. There are plenty of designations (all those letters after my name) that seem like so much alphabet soup. But once in a while something really new comes along, and I'm able to offer my clients more choices. That's the whole idea behind the Accredited Consultant in Real Estate (ACRE) designation – choices about what services you receive when buying or selling real estate. And I'm very proud to be the first in Baltimore to earn the ACRE certification. What you can do yourself to save money when selling your home without using a discount broker and getting discount service. Or suppose you want help selling your home but need to know exactly what it will cost? An ACRE consultant has the option of setting a flat fee for services no matter how long it takes. And of course the ACRE-certified professional can always offer the traditional commission arrangement if that is the best choice for you. ACRE is a whole new approach to real estate. If you'd like to know more, give me a call (410-530-2400). With ACRE there are more choices, and that's something everyone can appreciate. It's true of poker, and I think it is also true of real estate and many other professions. My friend who is a personal trainer saw Oprah interviewing someone who lost lots of weight and used a personal trainer to help get her back in shape. The newly slim woman loved the trainer so much and praised the way she helped. Not satisfied to just tout the wonderful talents of the trainer, she decided to take a few courses, learn how to train others, and become that person who gets accolades. She wanted to be a personal coach, helping people to change their lives by losing weight and exercising. Her intention was good. But the chance of her hurting people through inexperience is much greater than of helping them. Intentions do not make you an expert. Watch a professional ice skater glide across the ice, spin, and leap. Then watch an amateur and see that it is soooo hard. Years of practice, study, and training, are needed before you can make it look easy. I have found that many buyers and sellers decide to go into real estate after their own transaction. They think, "So much money for doing so little…." or so it seems. I am asked for mentoring, leads, coaching, technology tips, what classes to take…and I give this advice freely. I have dozens of clients who have gotten their real estate licenses because I made it look so easy. Many times I meet these agents in classes that I am speaking at or attending. They are surprised. Why is an established agent still going to these seminars? Too often, they just don't get it – that making it look "easy" takes years of practice and experience along with continual learning. How many of these former clients have made a success in real estate? How many have even made it through the first year? How many have sold the house that I helped them buy within that year? How many have blamed the poor market on not being a success? I think you can guess. Many people can take the classes, pass the exam, and do all the things an agent "should" do. But no matter what new gee-whiz technology or sure-fire system you want to try, there is still nothing like good old, roll up your sleeves experience. It takes time and effort to acquire, but you can see the dividends in loyal clients, repeat business, and income that reflects all that hard work. A Presidential primary in Maryland is not unusual - it happens every four years. What's different this time around is that the "Potomac Primary" (Maryland, DC, and Virginia all vote the same day) is getting national attention in the races for Democratic and Republican nominees. So if you haven't already done so, now is the time to decide who you will vote for in the national, state, and local elections that take place tomorrow, February 12. There will certainly be change no matter which candidate gets the keys to 1600 Pennsylvania Avenue, so be sure to have your say about who that is. The pundits and the national media are watching the national delegate counts for the nominating conventions, but you have more choices that are just as important. There are Congressional primaries, county school board elections, and judges to be elected as well in Maryland. You can read up on the candidates in voter's guides that newspapers and websites offer. The Washington Post has pages devoted to the candidates here: http://tinyurl.com/2xtpbo. Scroll down and click on either the Republican Party or the Democratic Party and you'll find information on all the candidates. On each candidate's page you learn about their funding and read their statements on the various issues. That same first page on the Post also has information on Congressional candidates, judges, and school board candidates by county. With your decisions made, you're ready to vote come Tuesday morning. If you're not sure where your polling place is, go to the polling place locator site of the University of Maryland, Baltimore County. You enter your name, zip code, and birth date; the site will confirm your voter registration, party affiliation, polling place, and tell you which U.S. Congressional district and Maryland legislative district you live in. That's it. You're ready. The 2008 elections will affect every person's life, so make sure your voice is heard. VOTE Tuesday, February 12!